Home » All » Nutrition Tips » Looking and feeling older than you really are? You could just be dehydrated – read more here. Looking and feeling older than you really are? You could just be dehydrated – read more here. I just saw this amazing article about how drinking the recommended amount of water has helped Sarah Smith look and feel younger. 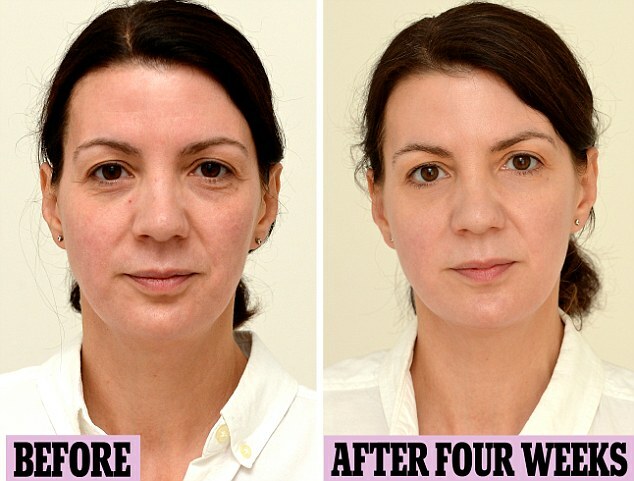 Her diary-like article details the little adjustments she made to her lifestyle in order to increase her water intake for 4 weeks, and the difference it made to her appearance and mood. I quickly found two things particularly fascinating: (1) the importance of drinking adequate amounts of water, and (2) how easily we overlook this and unknowingly abuse our own bodies! As you can see from the before and after pictures, drinking more water led to an improvement in the texture of Sarah’s skin as the wrinkles became less obvious. Also, her overall complexion improved as her skin tone became less blotchy. These changes made her look drastically younger. Dehydration had caused her skin to lose its elasticity and appear more shrivelled and wrinkled. With adequate hydration, Sarah’s complexion became more dewy, plump and clear. Contrary to popular belief, there is little scientific evidence to show that drinking more water would result in better complexion (read “Is drinking extra water good for your skin?”). The transformation Sarah Smith undergone were so amazing because she was very dehydrated to begin with. This is indicated by the various symptoms she reported such as dark yellow pee, constipation, and complaints of frequent headaches. Because she was very dehydrated, her skin lost its elasticity, thus adding more years to her age. Sarah reversed this easily by increasing her intake of water to appropriate levels. Water is not the new anti-aging cure, but Sarah’s mini experiment showed us the easily neglected yet devastating effects of dehydration. Dehydration is a result of excessive loss of water from the body (up to 8% for marathon runners), but even mild forms of dehydration (approximately 1.5%) has a considerable effects on the body and mind. Furthermore, we do not feel thirsty until we are 1 to 2% dehydrated which would be too late. By then, dehydration has already set in and impacting the performance of our mind and body. This shows the importance of making it a point to stay properly hydrated all the time. Sarah says that her urine is clearer in the first week of her drinking more water. Clear and odourless urine is one of the first indicators that she was doing a good job in getting sufficient fluids. The kidneys job is to cleanse and remove toxins from your body, but when a person is dehydrated, the kidney would trap extra fluid for bodily functions and that causes an increase in the colour, concentration and odour of the urine. In the long run, drinking insufficient amounts of water can result in kidney stones. Sarah reports that she was able to perform yoga moves more easily in the morning since she became properly hydrated. Body flexibility is the range of limb movements around the joints, i.e. to move from a flexed to extended position. Synovial fluid acts as a lubricant allowing bones to glide over one another when we move our joints, reducing friction between tissues in joints to lubricate and cushion during movement. Synovial fluid is mostly made up of water, so drinking plenty of water hydrates the joints, helping to keep it lubricated. Sarah noticed that her breathe smelt less ‘breathy’ after she skipped tea with milk for water. Paul Vankevich, assistant professor at Tufts University School of Dental Medicine states that any food or drink can briefly cause breathe odours if allowed to linger in the mouth. Foul-smelling bacteria thrives on food left in the mouth. This can be easily fixed by drinking water, an odour-free liquid that helps to flush the bits of food that these bacteria feed on. Coffee and alcohol on the other hand, can dehydrate and create a favorable environment for oral bacterial growth. Dehydration causes a dry and sticky mouth, as reduced saliva flow allows smelly bacteria to linger. Water keeps the stomach and tongue hydrated and clean, preventing bacteria buildup and curing bad breathe. Sarah stated that being properly hydrated help make her feel more productive and focus more easily. The link between dehydration and the mind can be seen in two recent studies studying the connection between cognition and mild dehydration. A recent study published in The Journal of Nutrition showed that mild dehydration caused headaches, fatigues and difficulty concentrating in young women. They also perceived tasks as more difficult when slightly dehydrated. Another study published in the British Journal of Nutrition showed that mild dehydration in young males resulted in difficulty with mental task, particularly in the area of vigilance and working memory. Sarah did not state specifically that she felt an improvement in mood, but a common symptom of dehydration is mood swings. Based on her tone and optimism in the article, I’m hazarding a guess that she probably did feel loads happier. In the two previous studies, mild dehydration was also found to affect mood. Both young men and women experienced fatigue, tension and anxiety when mildly dehydrated. Women is found to be more susceptible to the adverse effects of mild dehydration as the mood were found to be substantially greater in females than in males. Sarah says that since she became properly hydrated, she was no longer waking up with dry eyes. There is a link between decreased potassium and dry eyes. If you are dehydrated, than your electrolytes, including potassium, may be low, which may result in dry eyes. Other than water, Michael Lange (OD, CNS) recommends drinking coconut water as it is hydrating and contains lots of potassium. Weight loss and shaving an inch off her waistline. Sarah lost 2lbs and shaved an inch off her waistline in just 4 weeks, and she feels like her tummy became slimmer. Water is always part of any weight-loss strategy. Firstly, dehydration can lead to excessive calorie consumption. Thirst can easily be mistaken for hunger, which can cause a person to search for food and consume unnecessary calories. Adequate hydration would ensure that the body does not receive mixed signals of hunger. Secondly, dehydration slows down your metabolism. A systemic review between water consumption and body weight outcomes done in 2013 showed that increased water consumption for dieting or weight maintenance resulted in a weight-reducing effect. This could be due to an increase in metabolic rate caused by the consumption of water (Boschman et al, 2003). Thirdly, since water contains zero calories, drinking water instead of a sweetened beverage would help to reduce the amount of calories one consumes. Fourth, a dehydrated body retains water as a survival mechanism. A well-watered body would reduce water retention and would naturally look slimmer. Cellulite is a particular type of surface body fat with a dimply and lumpy appearance. Nothing can eliminate cellulite completely but being properly hydrated can reduce the appearance of cellulite through several ways. Adequate water intake can aid in a weight loss strategy, and losing body fat would also reduce the amount of cellulite in the body. Also as shown before, being properly hydrated means your skin regains its elasticity and would look better. Sarah noted that she did not have headaches ever since she started hydrating properly which likely indicates that she was suffering from dehydration headaches. It is not known specifically how dehydration causes headaches, but it is likely a by-product of the body’s effort to maintain adequate fluid levels. One explanation is that when a person is dehydrated, blood vessels narrow thus reducing blood and oxygen to the brain. The brain cannot feel pain, so the discomfort felt in the head may result from pain receptors in the lining that surrounds the brain. Another possible explanation is that when dehydration occurs, the body loses water and essential salts (like sodium and potassium). This results in chemical shifts in the blood that the brain is sensitive to and the nerves may interpret it as a headache. Hence, staying properly hydrated would keep these headaches at bay. Sarah also says that her bowels began moving better. Dehydration is a common cause for constipation, among various other reasons. If a person is dehydrated, the large intestines would soak up all the water from the food waste which results in hard stools that are difficult to pass. Getting sufficient liquids can prevent and alleviate constipation by facilitating flow of food through intestines. How much fluid is adequate for proper hydration? It is usually recommended that people drink at least eight 8-ounces of water (approx 2L) a day. However, this serves only as a guideline and some may require more for adequate hydration depending on their body mass, lifestyle and environment. For instance, a larger individual need more fluid to properly hydrate. A person leading a more active lifestyle would need to replenish water lost through sweat. And dry environments may cause sweat to evaporate rapidly, thus one may not realise when they are losing water. In Sarah’s example, her GP recommended her 3L of water a day to stay hydrated, which is above the recommended guideline. Determining the appropriate amount of water for proper hydration is not difficult. The colour of the urine can be a quick and simple indicator of whether one is properly hydrated. As shown earlier, properly hydrated individuals have clear to light-coloured urine while dehydrated individuals have dark yellow to tan coloured urine. So making sure that your pee is clear is a good indication that you are drinking enough water! I admit that I am really bad at staying properly hydrated, so I bought a 1.5L BPA-free bottle about two months back that I aim to refill at least 2 times a day to ensure I get at least 3 – 4.5L of water. It was going pretty well until I lost the bottle 2 weeks ago because I carried it everywhere. Reading Sarah’s article and researching for this blogpost is lots of motivation for me to get a new one and get back on track! Many estimations show that more than half the population do not drink enough water. How do you keep yourself properly hydrated? This entry was posted in All, Nutrition Tips and tagged beauty, dehydration, h, health, mild dehydration, Sarah Smith. Bookmark the permalink. ← Where to buy Chia Seeds in Singapore?